Bachelor of Information Technology(BIT) is one of the demanding and popular course. The course will equip students with the technical skills and knowledge to succeed in this expanding and diverse industry. Students will get exposed to the practical experience in the field of information technology that can apply technical skills to solve problems, support innovation, and improve communication between people. The Bachelor of Information Technology is an academic program of Purbanchal University comprising of core unit and advanced unit. The core unit of Bachelor of Information Technology (BIT) covers the fundamentals of information technology that provide students with knowledge and skills in programming, systems design, computer networks and communication. The advanced unit enables students to exercise, develop and apply their knowledge and skills in the areas of Multimedia, Artificial Intelligence, Mobile communication, Internet and World Wide Web. 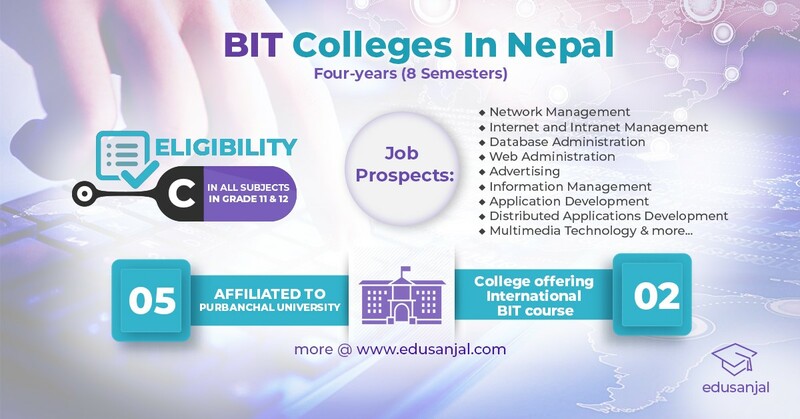 Bachelor of Information Technology(BIT) is a four-year, eight semesters, academic program of Purbanchal University that provide students with knowledge and skills in programming, systems design, computer networks and communication. The advanced unit enables students to exercise, develop and apply their knowledge and skills in the areas of Multimedia, Artificial Intelligence, Mobile communication, Internet and World Wide Web. The course offers scientific and technical depth along with study in areas such as management, communications and aspects of human behavior, all of which are vital to the success of an IT professional. Bachelor of Information Technology will prepare students for a career in regard to computers and information where one can apply technical skills to solve problems, support innovation, and improve communication between people. Train students to analyze, design and implement computer-based systems related to recent developments like internet technology, multimedia, web-based applications and mobile communications. Impart knowledge to appreciate the rapidity of technological changes and develop an understanding of field of study, relevant to the integrative design. Build ability to use communication technology and enable to apply these skills in the various communication medias. Develop the abilities and interpersonal skills important for effective participation and leadership in industry. Bachelor of Information Technology (BIT) Graduates are well equipped with technical skills and are highly sought after by Information and Communication industry. They have excellent opportunities available for progressing into management and leadership positions. KIST College was established in 1995, one of the preferred institution by students for +2 Bachelors and Masters level programs. KIST College offers offers high standard NEB +2 Science & Management courses, a range of top quality Bachelor’s degrees – BBA, BIM, BIT, BBS & BSc Microbiology. Kantipur City College (KCC) was established in 2000 AD, is affiliated to Purbanchal University. KCC , located conveniently in Putalisadak, Kathmandu offers different courses in Bachelor and Master level. Currently, it offers, BBA, BE Civil Engineering , BCA, BE in Computer Engineering, Bachelor of Electronics and Communication Engineering, BIT, MA in Mass Communication and Journalism, Master of Computer Application, Post Graduate Diploma in Computer Application. College of Information Technology and Engineering (CITE) was established to address shortage of IT, Engineering and Management professionals in Nepal and abroad. It offers BBA, BCA, BE Computer, BE Electronics and Communication and BIT. Aryan School of Engineering and Management is affiliated with Purbanchal University and is offering BE in Civil Engineering , BCA, BIT and BBA program. Faculties at ASEM are highly dedicated and qualified to standardize the Engineering, IT and management education. Purbanchal University School of Engineering and Technology (PUSET) was established in 2056 B.S. It offers BE in Civil Engineering, BCA, BE in Computer Engineering, BE in Electronics and Communication Engineering, BIT, Master of Computer Application and Post Graduate Diploma in Computer Application. In Nepal, there are few colleges that offer International BIT course. Padmashree International College , located at Tinkune was established in 2007 A.D with an affiliation with Nilai University and Tribhuvan University. The college is offering BIT, BABHM and B.Tech (Food). The college is set up with the vision to bring global standards of IT, Hospitality and Food Science College to Nepal and produce scientific manpower of high caliber. Texas College of Management and IT, located at Siphal, Kathmandu, with the affiliation with Lincoln University College is an educational institution with outstanding academic programs in Management and Information Technology (IT). The college offers BBA, BCS, BIT and MBA. TCMIT has been founded with a set of academicians and entrepreneurs to meet the rising demand for qualified and skilled manpower in the field of Management and IT.